The prefabricated wood garages can be delivered in all of Virginia and West Virginia. Wooden Duratemp painted T1-11 prefab garages come standard with 25 year shingles. 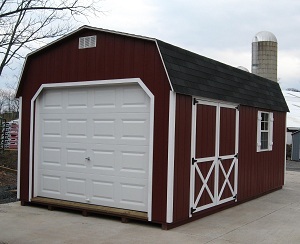 Alan's Factory Outlet is a company that specializes in Amish built sheds, carports and garages. We also have an inventory of portable storage buildings. The workmanship and the craftsmanship of these items are like no other. They are built to last and provide you the space and the security that you are looking for. Free delivery on Amish built wood garages to 21 local counties in Virginia including the counties of Arlington County Virginia, Augusta, Caroline, Clarke, Culpeper, Fairfax, Fauquier, Frederick, Greene, King George, Loudoun, Madison, Orange, Page, Prince William, Rappahannock, Rockingham, Shenandoah, Spotsylvania, Stafford and Warren County in Virginia. The garage is also delivered for free to these towns in VA, Staunton, VA, Bowling Green, Berryville, Warrenton, Winchester, Standardsville, Lessburg, Luray, Manassas, Harrisonburg, Woodstock, Alexandria, Falls Church, Fredericksburg, Waynesboro & Front Royal, VA. The wood garage prices now included free delivery to 30 local counties in VA and 8 counties in WV. The wood garages are only delivered in two states of Virginia and West Virginia.